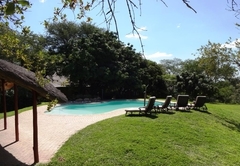 Mohlabetsi Safari Lodge is a 4 star graded game lodge offering Balule accommodation for tourists and visitors of the Valley of the Olifants. 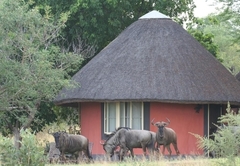 Tony and Alma warmly welcome guests to their relaxing and friendly oasis in the bush. 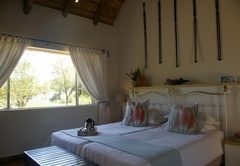 Set in the vast Balule Nature Reserve, within the Greater Kruger National Park, this is home to a superb variety of fauna and flora, including the “Big 5”. 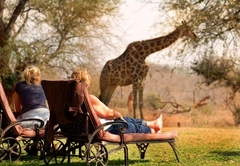 Enjoy the very best safari experience possible at this congenial retreat. 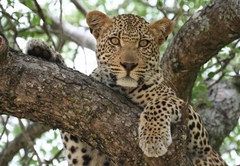 We will give you lasting memories of Africa’s spectacular wildlife. 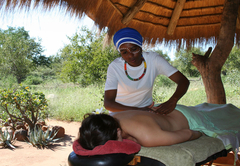 Set in the heart of the African bush, Mohlabetsi is situated in the Balule Nature Reserve, in the western sector of the Greater Kruger Park. 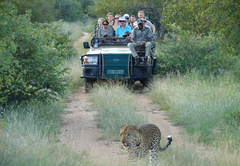 Here, the rhythms of nature dictate the movements of the animals and we are a privileged audience to these activities. 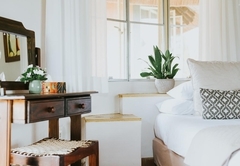 The two Lodges are an integral part of the bush, allowing our guests to immerse themselves in their environment, becoming especially close to the African Spirit. 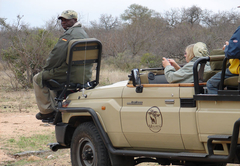 Especially modified Landrovers ensure comfortable game drives, with up close encounters with big game, while foot safaris allow one to explore the myriad of smaller creatures that are resident here. 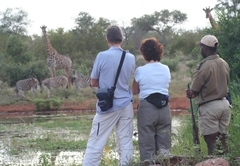 We have vast areas of traversing over numerous eco systems for peaceful and uncrowded safaris. 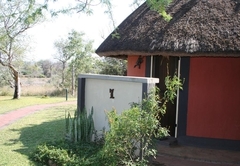 Mohlabetsi is easily accessible by road or daily flights from Johannesburg. 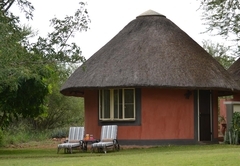 The Safari Lodge offers just 6 comfortable thatched ethnic rondawels decorated in an African theme. 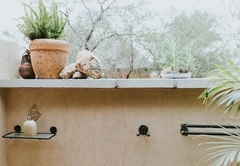 A delightful al fresco shower allows for ablutions with a view over the bush. The rondawels are fully insect proofed and have overhead fans. 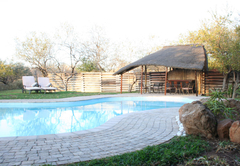 There is a sparkling swimming pool and an outdoor lapa with a vista to a well-frequented waterhole. 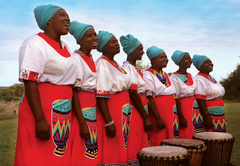 Traditional songs and dance by African ladies herald romantic dinners under the stars, often punctuated by the roaring of lions. 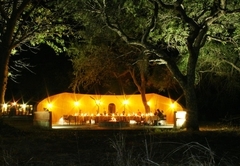 In the cooler months, the boma is used for dining around a roaring log fire and during the warmer months dinners are served on the lawns with a view of a floodlit waterhole. Meals are a reflection of Africa’s heritage and are lovingly prepared using the freshest ingredients available. Breakfasts and lunches are served in different locations, always with the emphasis on showcasing the wonderful produce grown in the region. 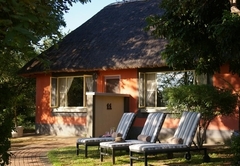 The Lodge is centrally situated and is thus an ideal base from which to explore the area. We are easy to find, just 7km off the tarred R40, slightly north of Hoedspruit. We are en-route to or from the Panorama Route and the Blyde River Canyon, via the Abel Erasmus Pass. 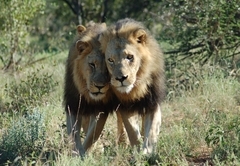 The Kruger Park is also close by - both Orpen and Phalaborwa Gates are about 80km from us. 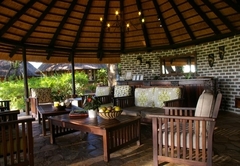 A beautiful 4 star African style chalet under thatch, decorated in an ethnic theme. 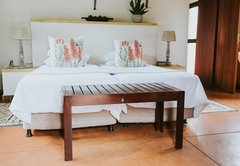 There are 2 interleading rooms, one with a queen-sized bed & one with 2 single beds. Bunk beds may be added for children under 12 sharing. There are 2 al fresco showers. 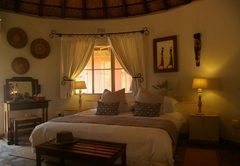 A beautiful four star African style rondawel under thatch, decorated in an ethnic theme, with 2 single beds. There is a wonderful al fresco shower. Bunk beds may be added for children under 12 sharing with their parents. The rate includes 2 safaris. 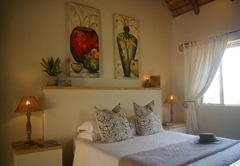 17 Reviews from SA-Venues.com travellers. All reviews are verified. Many many thanks for such a wonderful stay my niece and I experienced at your Lodge, once again. Your staff were wonderful and informative, fun and welcoming and the star gazing a great bonus for us all. We will be back! You made my African dream come true!. The decorations of our rooms and the whole lodge was charming. The surrounding sounds of wilderness all around. Tony guided us under the stars, Lucky in the bush - all fascinating to us. 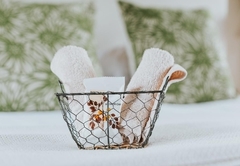 The short rests between safaris, bushwalks and all the lovely food we were served, we spend in the gardens, pool area and in the nice outdoorshower. Thank you for showing us a piece of your Africa . Mohlabetsi is a place to remember - in my hart! 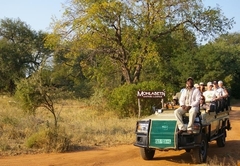 Response timeMohlabetsi Safari Lodge typically responds to requests in 5-10 minutes.